Each homeowner is unique, so why shouldn’t their deck reflect their individuality? At Chesley Fence & Deck, we understand the need for a deck that’s all your own, which is why we offer Columbia, Illinois area homeowners virtually limitless deck designs and a wide array of decking options to choose from. If you want a beautiful, rustic wood deck, then we have got you covered. We can provide two different wood decking options, including cost-effective treated lumber and lower-maintenance premium cedar. And, if you are more into synthetic decking, then we can offer a PVC Cellular option that is plastic throughout the product and our industry-leading Tamko EverGrain® Envision® PVC coated composite decking. The deck is custom built and designed in the size or configuration that best reflects the customer’s personal style and lifestyle needs. All technicians are trained in the proper ways to install our decking to ensure optimal performance year after year. The deck is protected by a three-year labor warranty for peace of mind. And, you can trust in our ability to provide unparalleled decking, deck designs, and installation services, as we have decades of industry experience. We even hold an A+ rating with the Better Business Bureau, which is evidence of our commitment to providing our customers with only the best. Ready to start designing your new decking? 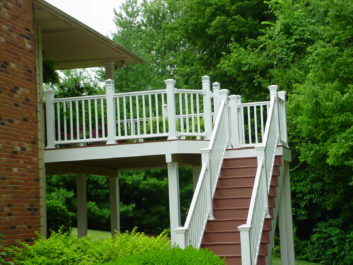 If so, then contact the decking experts of Columbia, IL – Chesley Fence & Deck. We would love to tell you more about our decking options, deck designs, and company.